Want more new homebuyer inbound leads? Your Guide to Landing Page Success. How do you know when a young millennial couple is shopping your website and dreaming about their first home? You don't, unless they self-identify. How do you encourage them to reach out so you can support their search? That's the topic of our blog post today. We interviewed HubSpot Gold Partner Spencer Powell, with the Builder Funnel about how to develop an effective promotional landing page. "Effective" for purposes of this this article means that a landing page increases inbound leads for New Home Builder brands. The outcome of our interview is this Guide to Premium Content and Landing Page Success. If you read nothing else, listen to Spencer's answer to our first question. It's a compelling argument for creating landing pages that trade relevant premium content for a prospective home buyer's contact information, so you can get them into your sales funnel. Marketing Blueprints: Most of our clients have invested in beautifully designed websites with gorgeous imagery of their homes. Why do you need to use promotional landing pages in addition to a beautiful, well designed website? 93-95% of prospects who came into the website downloaded a brochure, eBook, checklist and filled out information on a landing page. Home shoppers are researching and browsing tons of sites like Zillow, Trulia and Builder listing websites. If you don't capture them when they are on your site, they may never come back. You need to give your prospects a reason to take action to launch themselves into your sales funnel. Every page on your website is an opportunity to convert a prospect into an engaged home buyer with your brand. Marketing Blueprints: What's the number one goal of building a promotional landing page? Spencer: Get people to fill out the form which shares their contact information. Marketing Blueprints: Including the form, how many conversion opportunities should a landing page offer? Marketing Blueprints: Can you give us some examples of premium content that would be relevant to a prospect shopping for a new home? And, can you give our readers your time saving tips for creating that content? Marketers are super busy. Spencer: The easiest and least time consuming way to develop content is to reformat what you already have. Ask someone convert your Community Brochure into a nice looking PDF (which should cost you less than $100). Prospects want a summary of what is already available free on your website in the form of a Community Brochure and they are willing to give you their contact information for that. So, take what you have and repackage it into a PDF. Marketing Blueprints: If you've already converted your Community Brochure and you want to create some new premium content, what topics are worth developing? Marketing Blueprints: Where can Marketers get help to create this content? Many of our clients are strapped for time already. Existing Digital Agencies likely have your assets and can easily create some PDF's and a landing page. Builder Funnel can create all of this for you. Upwork has excellent freelance writers and artists who are easy to work with. Subscribe to landing page software. Here are a few of our favorites. HubSpot (our preferred choice, but it's more than just landing page software), UnBounce, Lead Pages. They're easy! Marketing Blueprints: Would you agree that the key feature of this landing page is Premium Content? Spencer: Yes! The page is all about telling your prospective home buyer, "Here's what you are going to get if you fill out this form." Without the premium content, you cannot necessarily convert these types of inbound leads. They are looking for information they can use to support their home research and ultimately their decision to purchase in your Community. Marketing Blueprints: How do you organize and build the actual landing page? Spencer: It depends on the size of your Builder entity and the kind of internal support you have. So first let's talk about what goes into this kind of landing page. 2.) Set up the form you are asking your prospective home buyer to complete: Enable prospects to fill out their information to receive the premium content. Once they fill it out, your landing page should initiate two other actions. A typical form asks for a first/last name, email contact and phone number at the absolute least. This way you are able to contact the person who filled out the form. At that point, we know they are interested in what you have to offer, so it's important to contact them. A second landing page says thank you to the prospect for engaging. This second landing page can then be used for another Call to Action. Offer your prospect the opportunity to schedule an appointment at your Sales Center. Some of them will be ready to take that next step. You won't know if you don't ask them! The form they fill out should also initiate an email that thanks them for engaging and reinforces the benefits of the Community you are marketing. Marketing Blueprints: That's pretty simple. Thank you! Now...How do you get prospects to visit your landing page? Marketing Blueprints: Now that you have a landing page on your site and CTA buttons in your Community content, how should Builder Marketers get prepared to take action on prospect lead forms? Spencer: Your form needs to feed into an email or CRM that is monitored by staff who can take action and respond to prospective home buyers. This is critical. Please don't spend money investing in a landing page unless you have this part of the process in place. The communication outreach is a simple email that might say, "Hi! Thanks for downloading our Community Brochure. Can I help answer any questions?" Be sure to put the new prospect on your email list and your newsletter list. You will want them to automatically get updates and to be invited to Community Events, etc. Marketing Blueprints: Do you have any bonus tips for readers who are advanced landing page users? Spencer: Yes! There is so much more than can be done to engage and talk to people digitally. Here are a few more ideas if Marketers have the time and capabilities. When a home shopper fills out the form, redirect them to a thank you page and the thank you page is a landing page with the download on it. You can then add a "step two" on the Thank You page that invites them to take further action and come visit the Community, schedule a private tour, join an upcoming event, attend a financing workshop, etc. If they fill out the form, you automatically have a sales-ready lead! Once they've filled out the form, they get specific nurturing campaigns tied into the Community. Nurturing Campaigns leverage your efforts to acquire a lead for your home buyer sales funnel. Marketing Blueprints: How do we leverage the time and money we've spent launching our landing page? Time is money and our readers are incredibly busy. Re-engage your data base with a promotional email letting them know you have a new piece of premium content. Immediately present the content to prospects that are already part of your nurturing campaigns. Post information about your new premium content on your Social Media Pages. Write an article about your new content in your Newsletter before you send your next update. Write an article about your new content in your company blog. If you use a branded USB drive to deliver Community content, add the new premium content as a bonus. Thanks Spencer! We appreciate your tips for creating landing pages that build lead volume for New Home Communities. I know our readers will enjoy immediate access to this simple Landing Page Checklist so they can begin to use premium landing pages to encourage qualified home shoppers to share their information. Home shoppers are online researching and getting educated so that they feel comfortable with their choice of new home builder. Giving them content they can use in this process engenders trust and prospects are willing to share their contact information in return. We hope this blog post adds value to your Marketing and that you test some of these tactics to enjoy a higher volume of leads. Thank for stopping by! See you soon. Marketing Blueprints is sponsored by Builder Promotions. Builder Promotions is a complete solution of branded products and print collateral that support the entire new home buyer journey. Looking for creative inspiration to promote your next Community Event? You are sitting at your desk with a cup of your favorite, thinking about what you will add to your upcoming Community Marketing event to make it memorable for prospective home owners. 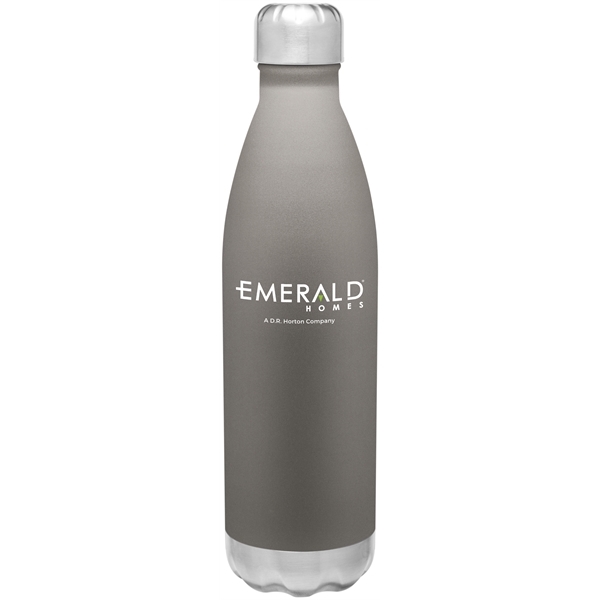 You think you'd like to use a branded gift to keep them connected to your community after they've toured your Models and met Sales Consultants. What to do? You have a million other details to handle to be ready for your event. If this is you, read on! 1.) 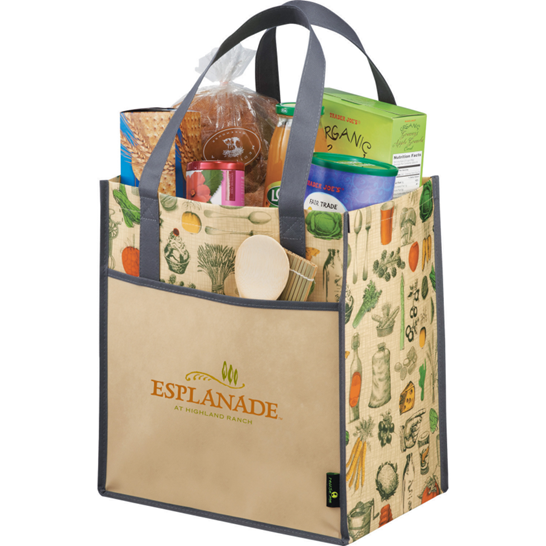 We love this stylish vintage laminated grocery tote which works triple hard carrying groceries, reminding your home buying prospects about their connection to your brand and advertising your communities to everyone one else in their midst as a small billboard. Under $3 for all that promotional power! Consumers love the all-over print look on these laminated bags, proven by the many upscale retailers who currently sell laminated shopping bags in their stores. 2.) 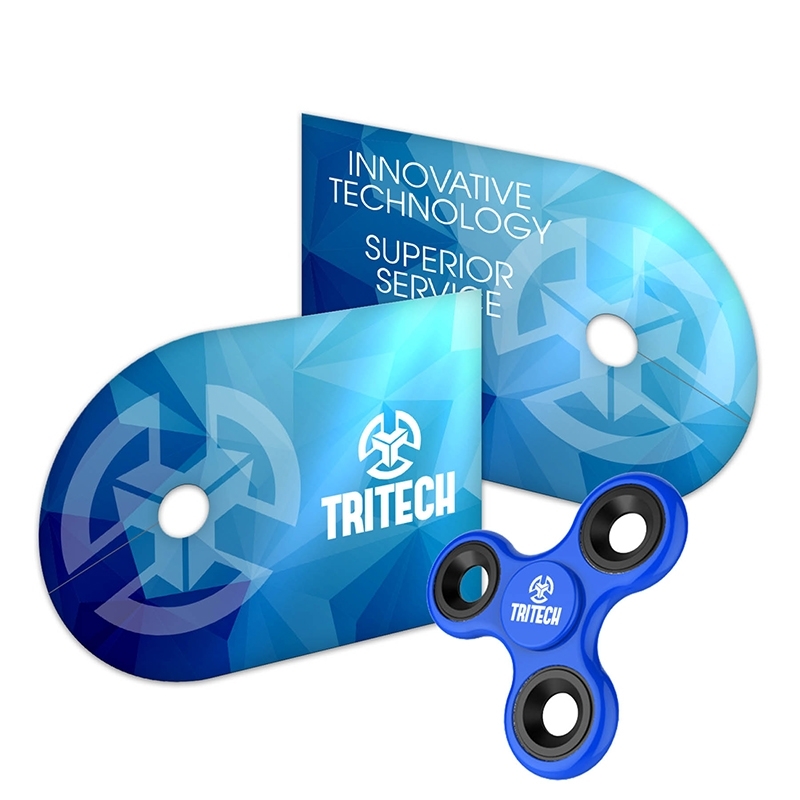 The Fidget Spinner is a hot trend right now and there's nothing like it to entertain younger family members while Parents are taking time to explore your enticing Sales Models. Under $2 with hours of entertainment value and fun. Packaging creates completely custom presentation options for $1.25 extra (min. 200 pieces). Promote schools, outdoor play space and family fun in your new home communities. 3.) Hot off the press and and arriving this month! 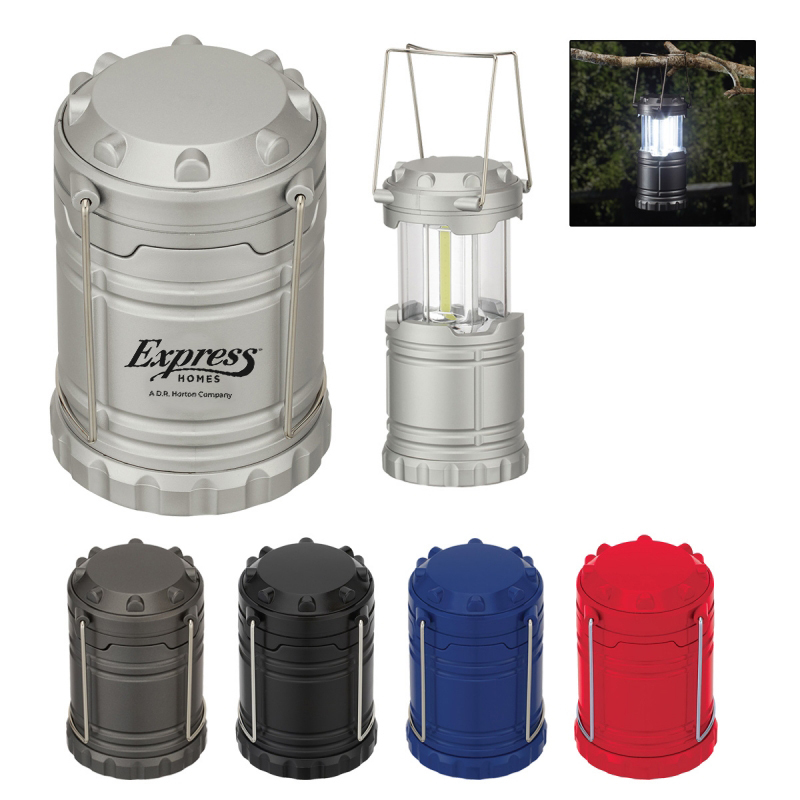 We love this well-priced pop-up lantern for Outdoor Family Summer Movie nights in your Community. It's a reminder to prospective homeowners that their new home in your community is full of promise for making endless family memories. Under $8. 4.) Trendy soda bottle-shaped water bottles are being used by consumers everywhere. High performance construction keeps liquids hot 12 hours and cold for 24 hours. As low as $13.55 for 26 oz. bottle. (retail brands are selling this at $35+ in stores). Consumers cannot get enough of this product. 5.) If great schools are a draw for your communities, align your event gifts with Fall back-to-school promotions. 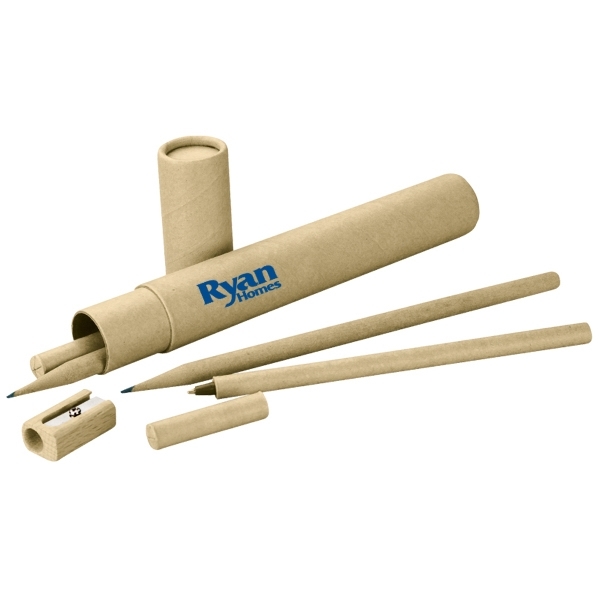 These compact recycled tubes carry a pen, pencil and wooden pencil sharpener, all for $2.15. Super easy to store and distribute. Where do you get your event inspiration? We'd love to know! Feel free to share on our Facebook page. When you visit our Facebook page, check out Eventbrite's list of 83 ideas for event types, styles and themes. Marketing Blueprints is sponsored by Builder Promotions, Inc. the leading builder-centric e-Commerce platform and group buying service. Builder Promotions centralizes and consolidates purchases of marketing supplies used to support the entire new home selling cycle. BP Custom Shopper (tm) and BP GroupBuy (tm) are signature services of Builder Promotions. Summer Events Invite Prospects to Have Fun with You. With the spring selling season well under way, Builder Marketers are thinking about how to keep the crowds coming to visit new home communities during summer months. Our Instagram account is filled with creative event themes (posted by Builders)that bring prospects and their families to new home communities. I'm a big fan of the outdoor movie night. I love a warm balmy summer night, great movie, my family and a bucket of popcorn on a soft lawn in my community park. I don't even mind that the fog often rolls in where I live as long as I have a blanket to stay warm! It's Memorial Day weekend, and I am already thinking of all the outdoor fun that awaits my family and me this summer. 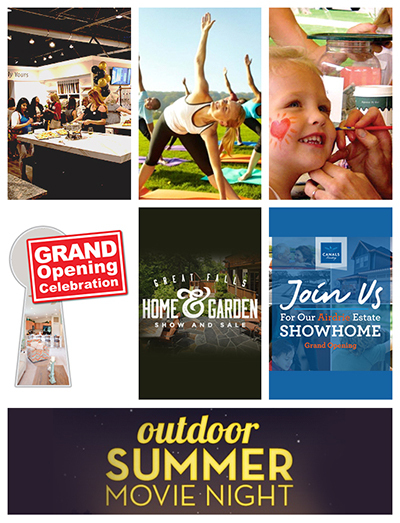 We just launched 10 new Home Builder Event Theme Collections in the Builder Promotions e-Store. Our collections are overflowing with an abundance of creative and fun ideas to support virtually any event theme you can think of! 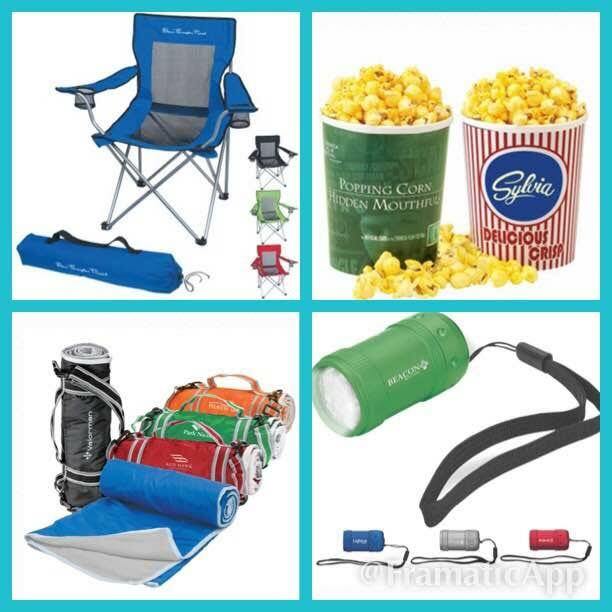 The Summer Movie collection has 30+ products -- 4 of which are pictured here in this Instagram frame. Summer begs us all to play more and relax a little. Click the links below to have a peek and have fun planning your events. 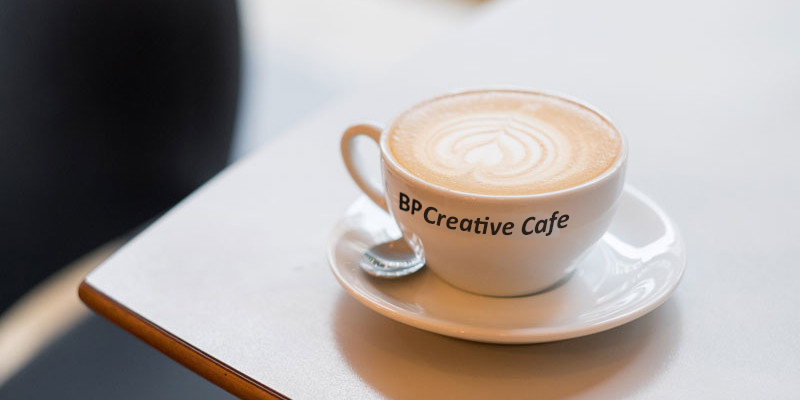 Our team is always here to help you create memorable brand gifts that strengthen your connection to prospects you are nurturing. What are you favorite event themes? Do you have pictures? Head over to our Facebook page and show us what you are doing! We're sending a free gift to any Home Builder who shares event content with us for the next two weeks. Marketing Blueprints is sponsored by Builder Promotions, an e-commerce company and group buying platform designed to help Builder Marketers procure branded products and marketing supplies used throughout the new home selling cycle. 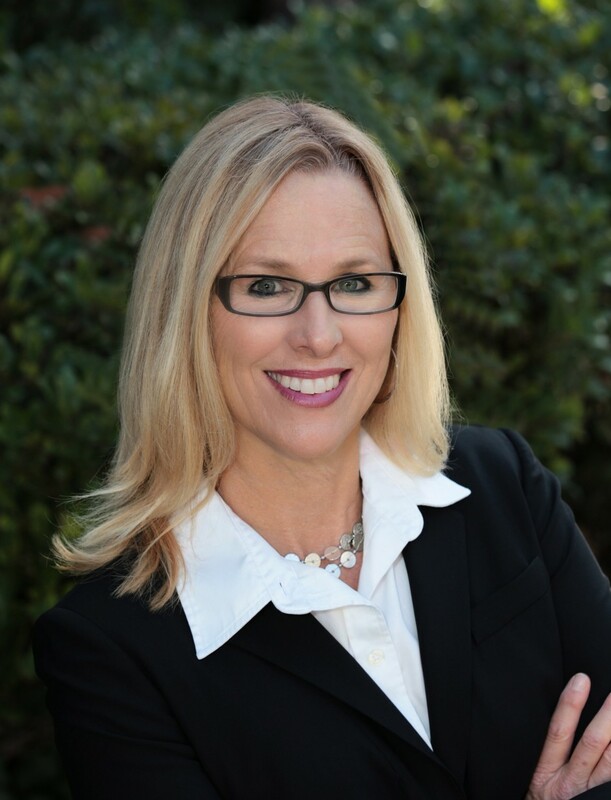 Are you cultivating Realtor relationships? This week I was a participant in one of the best webinars I've seen, bar none. BDX (The Builders Experience) spent 30 minutes showing Builders how to help Realtors bring their clients to see new home communities. I've included a live link to the Slideshare here for anyone who wants to get this information in a quick and concise format. 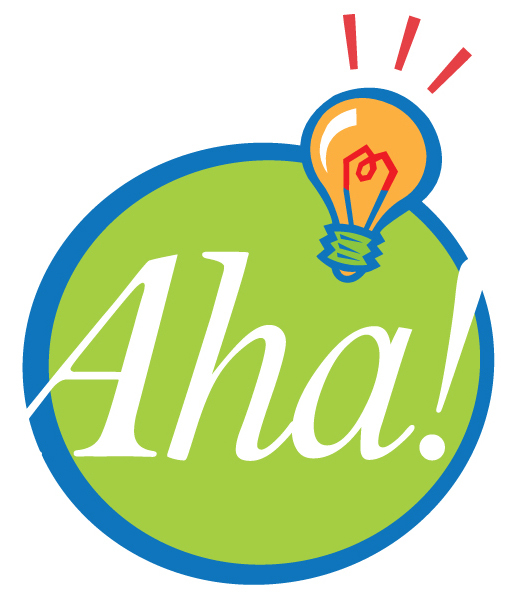 There are some great "aha" moments in 9 information-rich slides. Builder Promotions has been designing Realtor Referral programs for many years. My goal in listening to the Webinar was to get a solid grasp of the specific challenges in cultivating Realtor relationships in today's market. Everyone knows that the digital house hunt has changed the game for Builder Marketers. What I learned is immediately actionable to anyone with a list of Realtors in their market and web content they can repurpose to help educate and engage them. As a professional with Sales Management background, I was intrigued by the potential to add Realtors to your salesforce for very little upfront investment. Essentially Realtors are asking Builders for education, relationship building and respect that you are sensitive to the part they play in helping their clients navigate the new home buying process. According to experts, Realtors are ultimately representing 89% of all home buyers. They play an important role in new home sales by providing third party validation of Builder product and shepherding their buyers through the new home buying process. They are in your markets working with prospective home buyers already. How do you reach Realtors currently? Maybe you are doing enough, and maybe you want to test new points of contact. Perhaps you are just beginning to put marketing dollars toward Realtors again now that the market is trending up. Either way, here are 4 examples of solutions you can use to add Realtors to your sales efforts with tools from Builder Promotions. New Homes Sales Companion - Realtor Mobile App - $3000 to develop your complete App, and make it available to any Realtors you target in your market. Includes educational content about your new home sales process, convenient access to your listing feed, mobile client registration and key policy documents Realtors need to work effectively with you. There is a click to call or click to email button that Realtors can use to call you on the spot and make an appointment for their client. Video Brochure Direct Mail Campaign - $50 per realtor to develop a 5" x 8" dimensional video brochure that marries the power of video with the benefits of print and graphic design. This is aimed at showcasing your new homes with video you already have, like this video tour by Trendmaker Homes. Print design outlines the new home sales process, registration process and key contact information so that Realtors can share it with their prospects. Campaign design support and direct mail included. Realtor Referral Digital Platform: Digital gifts pair with a landing page that captures Realtor contact information or survey results, and rewards them with easy-to-redeem digital gifts from your builder branded site. You set the gift budget! Landing page design is $750. Reports on contacts that redeem are FREE. Consult to help define reward structure - no charge. Personalized Realtor Promotional Kit: Create a set of cost-effective branded gifts that are personalized for key realtors you are cultivating. Here's an example: a microfiber lens cloth is a product that does double duty as a brochure for new home product. Use it to communicate the basics of the new home buying process and personalize it with the Realtors contact information, "compliments of" your builder brand. $1 each! It's a cost-effective way to educate about the new home sales process. Personalizing these for Realtors let's them reinforce their relationships with their clients, while telling them about new homes sales as an option, too. We'd love to hear what you are doing to engage Realtors in your market. Head over to our Facebook page to share your ideas or post pictures of your Realtor events. Thanks for stopping by! Marketing Blueprints is sponsored by Builder Promotions, Inc. an e-commerce and mobile platform with a proprietary group purchasing system for Builders of all sizes. The platform enables builder marketers to manage branded products used throughout the home selling cycle, from any device. How Do You Extend the Impact of Your Community Marketing Events? If you are a home builder, a successful marketing event means you are introducing a prospective buyer or a realtor to your homes (in real time!). You have a chance, in-person, to showcase all the custom options that make buying new such a delight, and people get to experience what it feels like to be in a beautifully designed home. Anyone visiting a new home community also sees how the outdoor environment interplays with your models, and they begin to imagine their life in those spaces and environments. But that's just one day. It's been a successful event, and then everyone goes home. And chances are, your prospects are still looking at other competitive products, weighing their options. Last week, we launched a Community Event Marketing e-Store to help builder marketing clients extend the impact of successful events. We know our marketing clients are using every mean possible to keep prospects connected to their brand. The products in our Community Event e-Store are tools that work for you before, during and after events. They have the potential to draw a crowd, and they keep prospects connected to your floorplans, virtual tours, home albums, and other digital content. Some products work for you as mobile billboards and let people in the local area know about your new home community, too. We have selected products that integrate, enhance and fit into your prospects life to support their connection to you and nurture interest in your brand. We hope you take some time to shop around. Here's one product that provides a fun family experience at home. 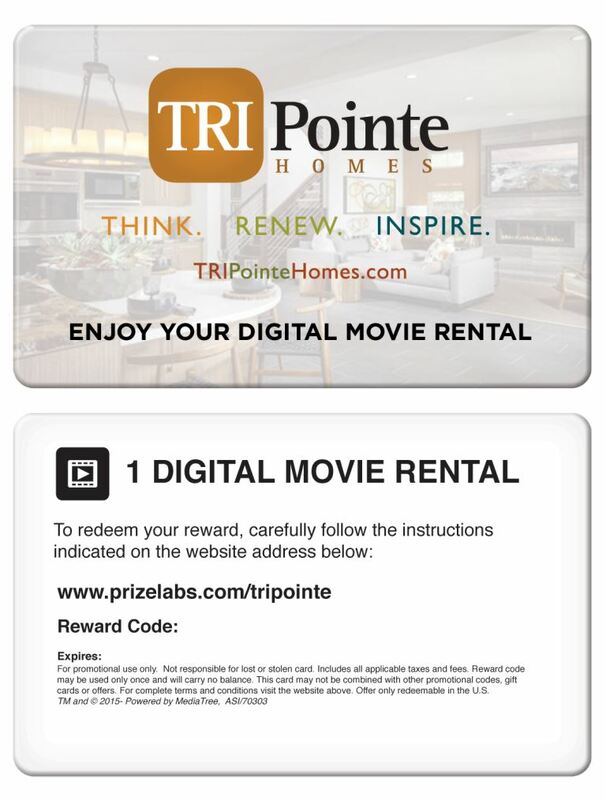 Our Digital Reward cards, reproduce photos of your homes and lead prospects to a branded landing page to redeem their digital gift (in this case a movie rental). When they redeem their gift, they supply their contact information. Our team quickly formats that data into a report for your Sales and Marketing teams, so they can follow up on prospects who attended your event. The gift, landing page, and reports are all included in your cost! Digital Movie rentals are a fun way to showcase your Great Room design. Check out our other digital reward gifts; Tree Planting, Music Download, Fitness Download or customize a Digital Choice card. Click here to learn more about how other industries are using digital rewards to engage prospects and capture important data too. You can use your redemption landing page to survey, capture contact info., promote a new community, or deliver specific detail about green building benefits. The key is that the gift integrates into your prospects' life in a way that connects them to your new home benefits. And, for this particular example, who doesn't love an excuse to enjoy a family movie night! How are you connecting with prospects after your events? We know this is one tactic of many! Thanks for engaging. Marketing Blueprints is sponsored by Builder Promotions, a branding and procurement platform that ensures brand consistency throughout the home selling process. When do you reward a digital house hunter for engaging with your brand? When does it pay to reward engagement on the buyer’s journey to becoming a happy homeowner? Ultimately, you decide that, but here’s our list of touchpoints where a well-placed reward might nurture your next happy homeowner. Thank Realtors who promote new home communities. They can multiply your sales efforts. Reward digital shoppers who click to call for a model home tour. Host a 48 hour Facebook Event where users share photos of life in their new home. Reward each entry and make a permanent album for Facebook. Recognize customers who tell their stories in video testimonials. They are credible to digital house hunters browsing your site at 10pm. Ask customers for online reviews and reward them for taking the time. 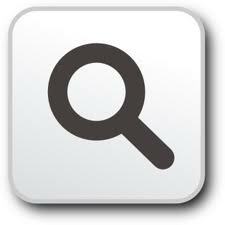 Google will reward you with better ranking because today’s house hunters expect to validate their findings with reviews. 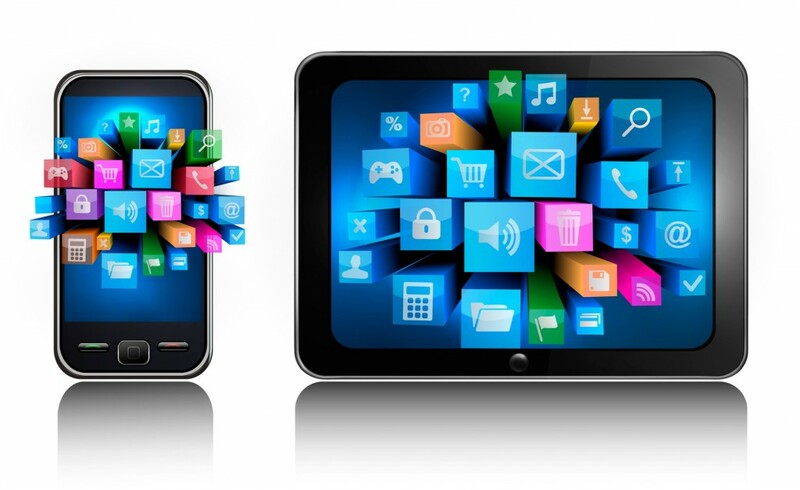 Reward prospects with a digital gift when they download your Mobile APP. Your mobile channel is the next new sales channel. Ask new homeowners for a family selfie on move-in day. Give them a branded selfie stick to inspire a playful photo shoot. Prospective home buyers want to imagine themselves having a happy life in their new home. Check out BP Digital Tech Store for cost-effective tech gear that provides the ideal real estate to give prospects an easy way to return to your digital content. Read our latest email and see 4 new Marketing Guides to inspire you. When it comes to Brand Marketing, there is only one version of the truth. Gratitude goes a long way. How do you convey your appreciation?